新年快乐大家！Wow, time really flies when you are having fun. I thought I was gorging myself with pineapple tarts and steamboat dinners but now… I have to worry about my FYP report and work. HAHA. 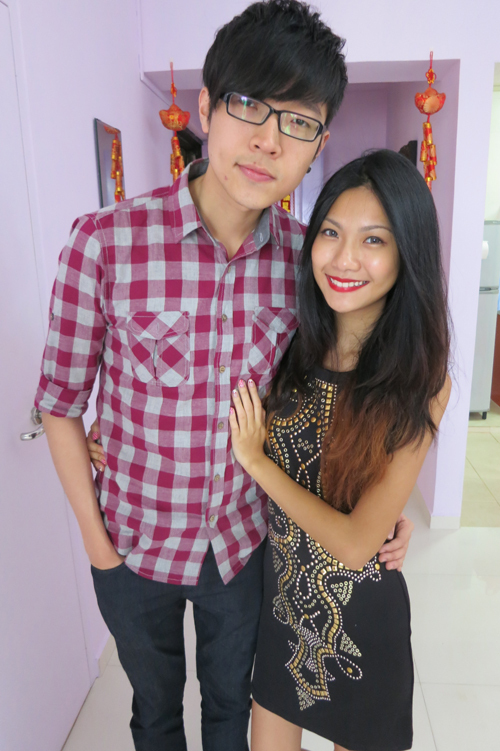 Anyway, here is how I celebrated my Chinese New Year this year! It was just about the same as any other new year I’ve celebrated, except this was my second time with Roy’s family. Hehe. 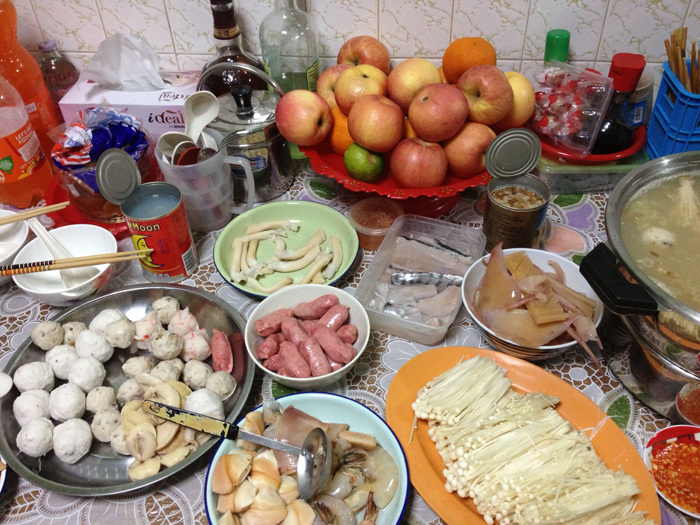 On 除夕(Chu Xi), which is the eve of Chinese New Year, it is a tradition where every Chinese family gathers to have their own reunion dinner. 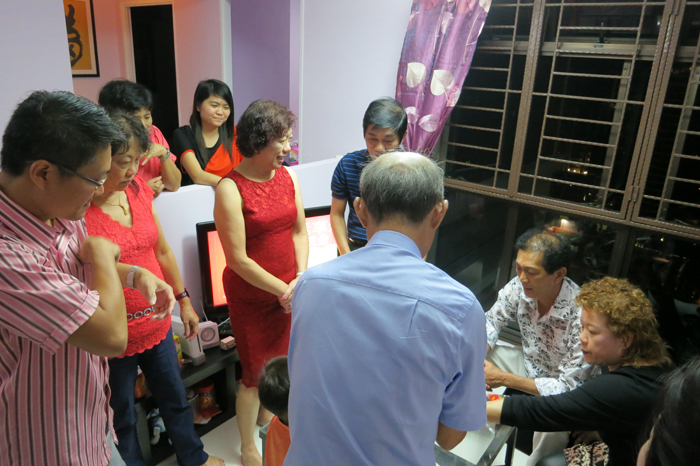 This year, we had our reunion dinner at my brother’s new place at Redhill! 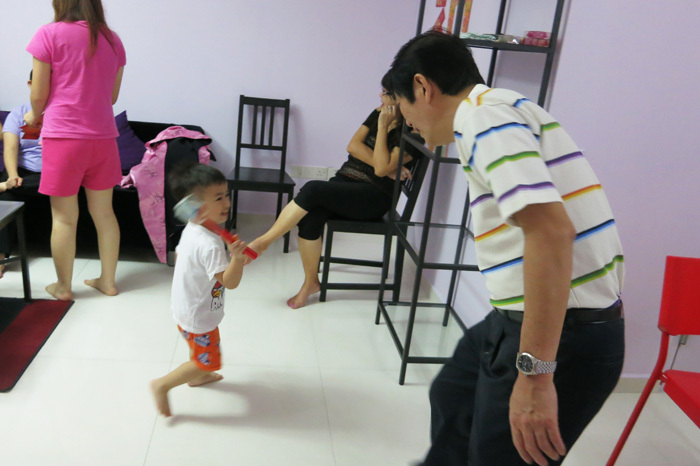 That’s my 3 year old nephew, Victor, playing with my Dad hahaha. I swear my Dad loves to disturb him and my nephew is always looking for my Dad to play with. Was digging my wardrobe and found this suede dark denim top which I bought from Bangkok bahaha. 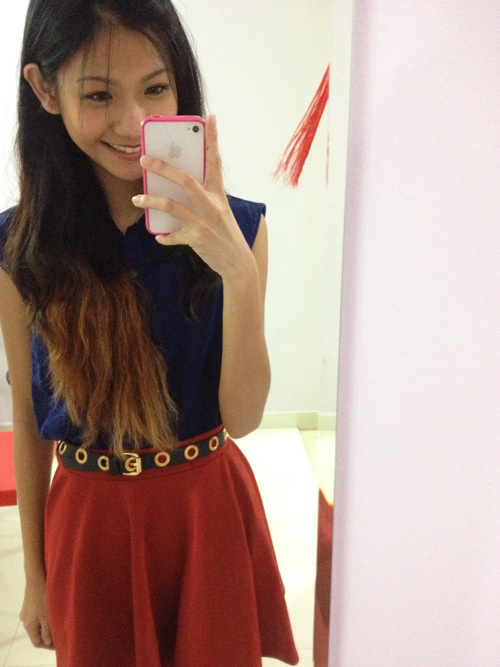 And those are my worn to death favourite belt and red skater skirt. 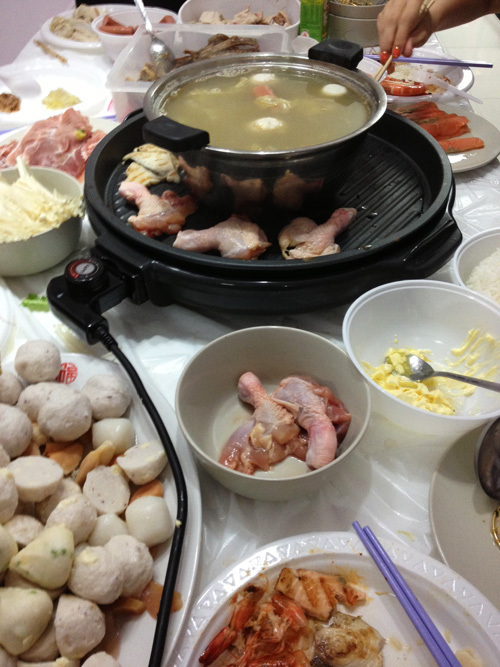 For my family, our favourite kind of steamboat is ALWAYS with the grill. Hehe. 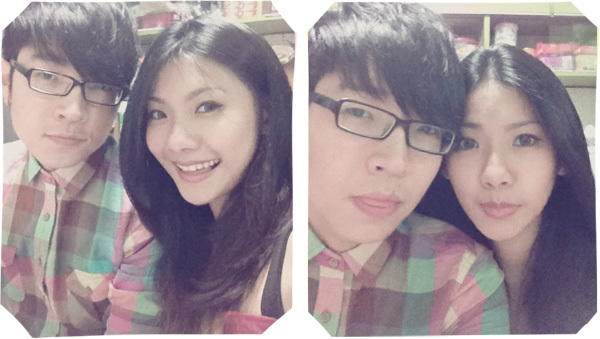 Kay and I would always start the steamboat by grilling our favourite chicken wings but this time there weren’t any. Also, abalone and pacific clams are a definite must-have!! 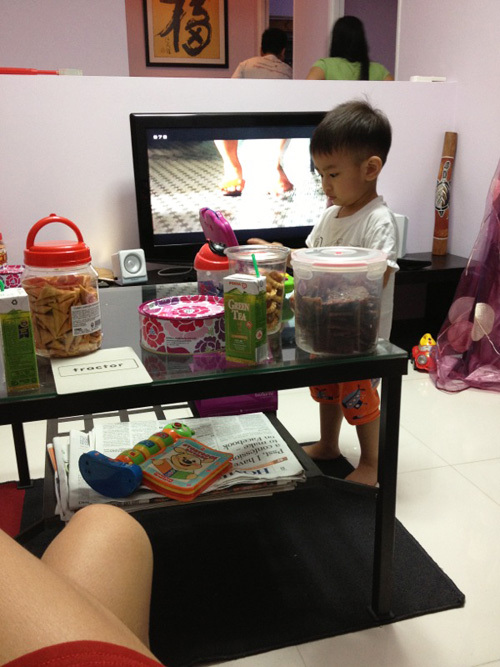 Kids are really such fun to play with when they’re happy, but when they start wailing and throwing tantrums… zomg. Please keep them far away from me. HAHAHAH HE PEED ON THE CARPET!! 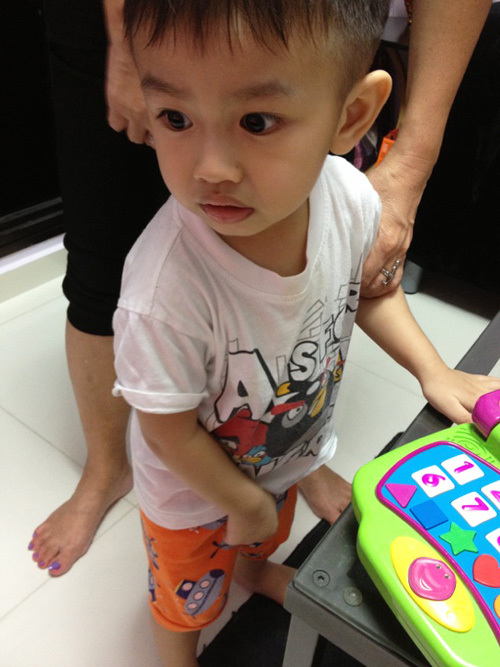 So anyway, Roy was at his own house having reunion dinner with his own family and I recorded this video of my nephew to send to Roy hiakhiak. Please pardon my nasal act cute voice thanks. On the first day of Chinese New Year, 初一(Chu Yi)! A simple outfit I put together that day. I wasn’t in the mood to shop for new clothes and so yep~ I like looking good but hate dressing up. 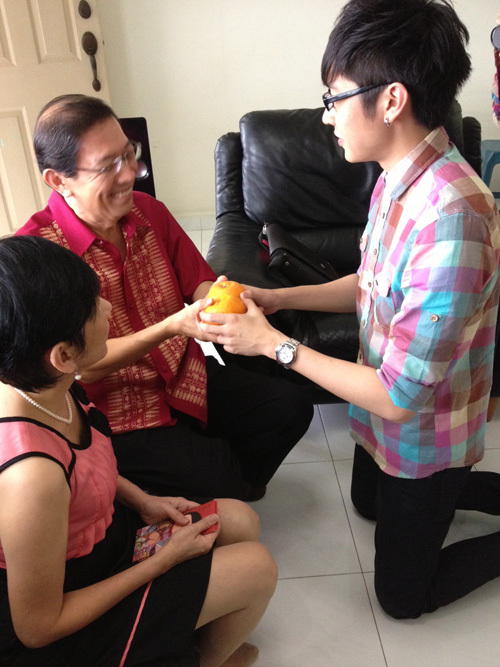 As the first child, Roy had to kick start the bai-nian to his parents. 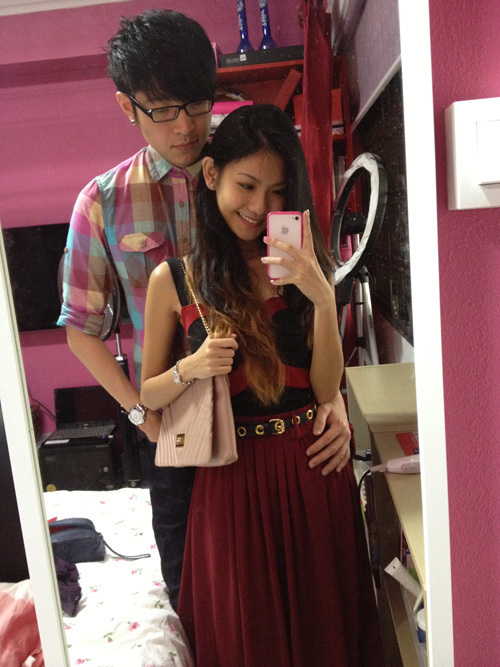 We went over to one of his relatives’ place for a while, and headed to my second ah yi’s place at Toa Payoh. LET’S FEAST! Kay’s favourite is Asparagus clams while mine’s Pacific clams! My pictures are from both my iPhone and my camera so sorry for the inconsistency in quality of photos. I have too many photos so I decided to put all of them just together. In the night, Roy’s Dad wanted to treat the family to dinner at a restaurant in MBS but all the nice restaurants were fully booked and we ended up at Beanstro.. I later learnt why it wasn’t fully booked. Anyway, the dinner at Beanstro wasn’t too good, I don’t even wanna post pictures of them here haha. I wouldn’t recommend dining at Beanstro. It tasted like any other normal food I could get easily outside at coffeeshops, so I don’t think it’s worth the money. I think Coffee Bean should just stick to making coffee. 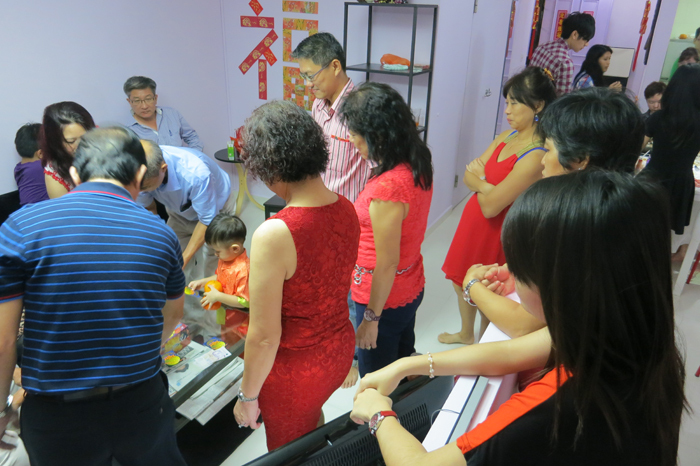 Moving on to the second day of CNY, 初二(Chu Er).. We went to my brother’s place in the early afternoon. Yay this is my sister, Kay! Do we look alike? 😀 When we were young, we didn’t look like sisters at all. 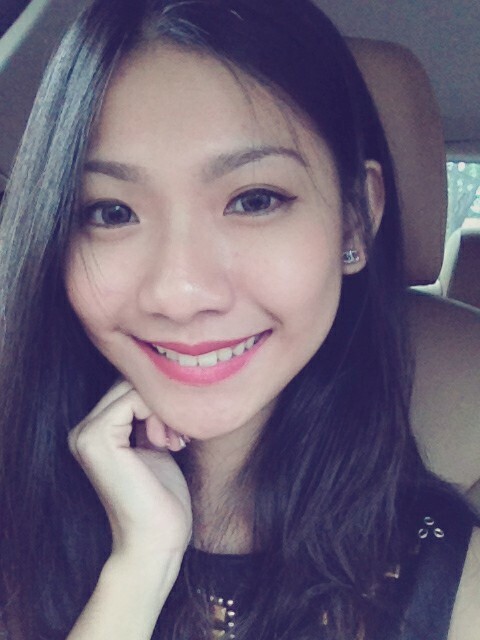 Like I was tanned and very skinny while she was normal size and very fair, WITH BIG EYES. But we are beginning to look alike me thinks. 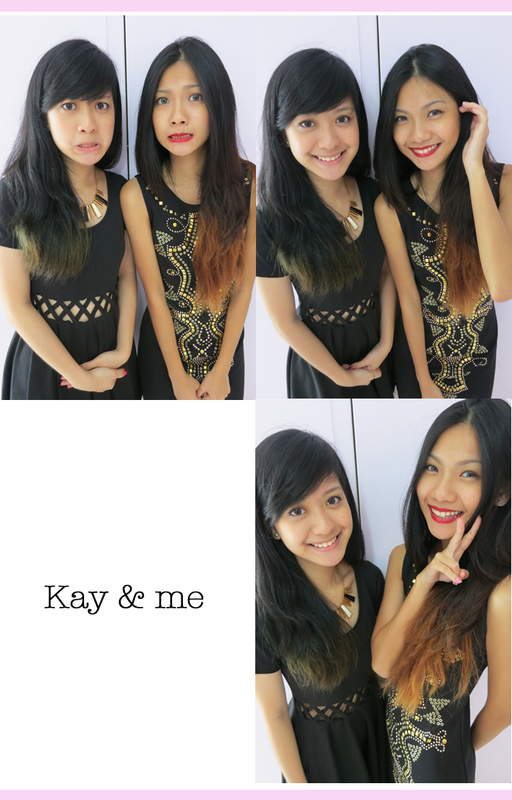 Kay’s getting a little less fair, and I’m getting a bit fairer lolol. My uncle couldn’t even recognise me at all. When he realised it was me, the first thing he said was, “YOU BECAME FAIRER!? 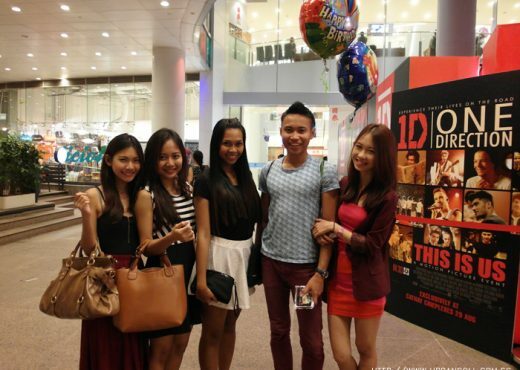 !” Okay no la I’m still quite tanned in real life, but a lot better than when I was much younger. I don’t have a proper OOTD picture but I was wearing a gold and silver studded black dress. I think it was $39.90 or $49.90, can’t remember. My aunty (mom’s sister) sells really awesome and popular popiah at Toa Payoh. There can only be one famous popiah in that area. So if you are staying there & you know about this popular popiah stall, yep I think that should be my aunty’s! hahaha. I’ve been eating her popiah since forever and have never ever wanted to try other popiahs simply because I think hers is the best. Okay l am stubborn la I admit okay. 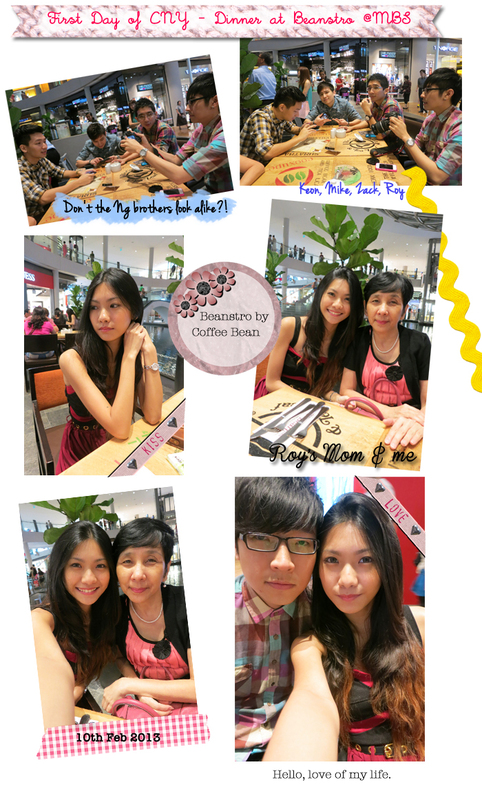 What is Chinese New Year without some fun with poker cards? The rule was.. the winner has to dance to gangnam style. LOL. 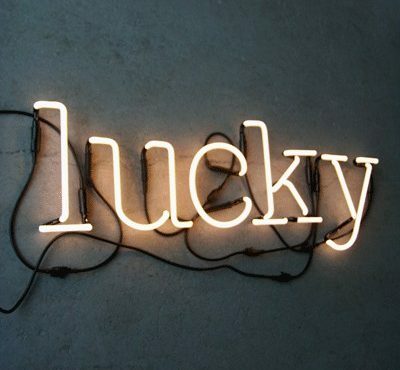 I know right. But it was fun watching all my uncles and aunties dancing and laughing. Even my nephew wanted to play! 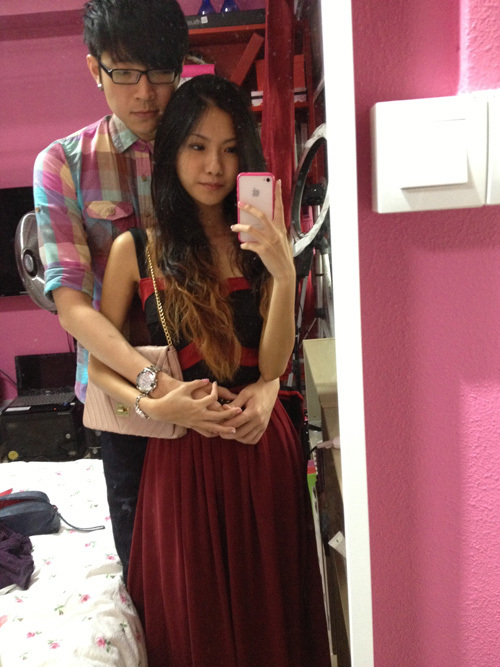 Roy and I then left for his auntie’s place at Hillview. Over there, it was our turn to play with cards! 😀 That’s all for Day 2 of CNY. On the third day of CNY,初三 (Chu San), I used some mascara I got from the US TWO YEARS AGO. Yes, my mascara expired. But it still delivered results! I was impressed. I think the mascara did a good job lengthening my eye lashes. I’m not sure if they sell it in Singapore. 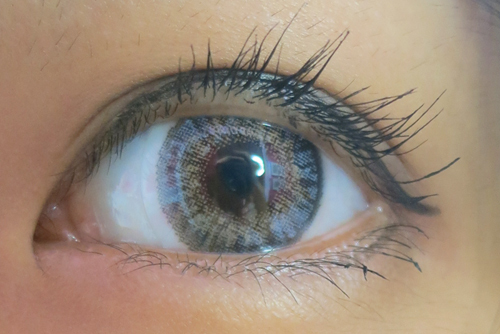 The expired mascara, however, resulted in 5 EYE STYES in my right eye. Omg, please do not ever use expired mascara!! I don’t blame the mascara though, I blame myself for using the mascara when I knew it was already wayyyy expired. Actually I was also using another brand of expired mascara for the past few days as well. So I think the accumulated use of expired mascara caused the eye infection. Hmm. If you didn’t know~~ we were heading to River Angbao @ Marina Promenade and then.. the car broke down in the middle of the highway. Don’t really wanna talk much about it because it has affected Roy and I quite a bit. I don’t think we could quite resume back to our normal lives until this thing is settled. That’s about it for my Chinese New Year!!! There are still some other photos in Roy’s DSLR but I don’t have them right now. 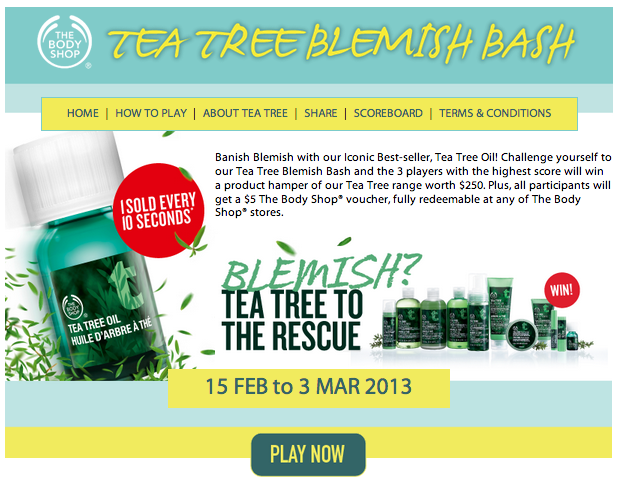 Anyway, The Body Shop has just launched a new Facebook game called the Tea Tree Blemish Bash. The objective of this game is to click on the blemishes 3 times to help Jane clear her blemishes. 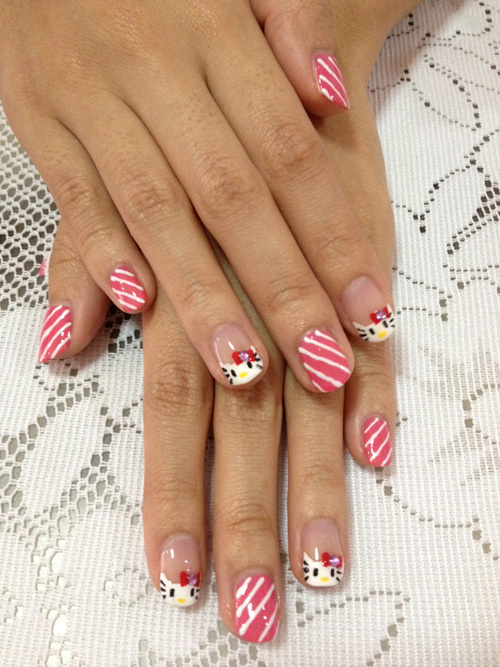 All participants will received a $5 The Body Shop voucher, full redeemable at any TBS stores. The top 3 bashers with the highest scores will win a Tea Tree hamper worth $250. If you didn’t already know, the Tea Tree Oil from TBS is one of it’s best-selling products! I’ve heard about it since forever. Tea Tree Oil is now retailing at $12.90 (UP $18.90), that’s 30% OFF! 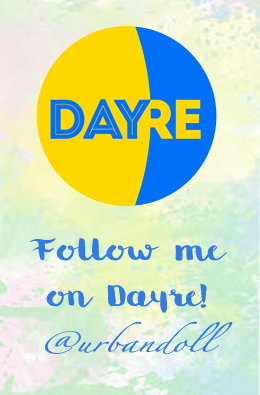 It’s a good chance to try out the product! 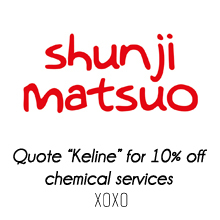 Stay tuned for my Valentine’s Day post!